Philippines has rich linguistic diversity. Through out its history Philippines was influenced by language and traditions of those who came in search of gold and other precious minerals. Today, you can hear smattering of Sanskrit, Arabic, Chinese, English, and Spanish in Tagalog. Tagalog is the widely used Philippine dialect. Filipino, the National Language of the Philippines is composed primarily of Tagalog words, idioms, and phrases. Urban Filipinos are fluent in English. Traveling few hours away from Metro Manila, I noticed people preferred to speak in Tagalog. 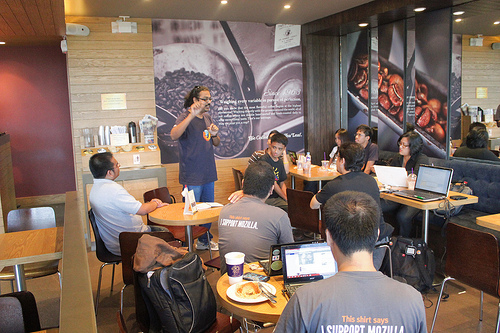 The Mozilla Tagalog localization was kick-started by Seth Bindernagel around 2010. After a hiatus, the Tagalog localization effort now gained momentum thanks to good leadership and innovative community initiatives to encourage localization (See Help Us Translate Firefox Aurora to Tagalog & Get a Mini-Shirt). We also have new localization teams for Chavacano, Bikol and Lloko languages. The hackathon in Manila provided me an opportunity to connect with the teams and I hope to keep this momentum going. Shared few ideas and emphasized on quality and consistence of translation. Such events are good for not only attracting new translators, but also discuss the problems in translation. The event attracted students, bloggers, technology professionals and contributors from Tagalog Wikipedia.